Short on time in Cairo, and keen on ancient history and boats? Then this private, full-day boating-theme tour packs in the sights. 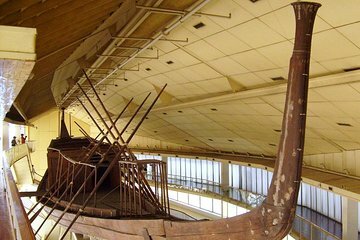 View the Giza pyramids and pharaonic barge at the Solar Boat Museum, and ride a ‘felucca’ sailboat on the River Nile. After lunch, see the boat artefacts and Tutankhamun’s treasures at the Egyptian Museum before enjoying a Nile dinner cruise. Private minivan transport and round-trip hotel transfers included.